Gaming merchant account is a specialized account which deals with only payments for gaming and casino companies. With so many online gaming sites on the rise, in websites or mobile apps, the demand for merchant account for gaming business is rising. We all know, gaming, also known as gambling is an old sport and with the advancement of the internet like all other businesses, this also has taken its place online. . One factor is that it is operated globally, so there is not just a demand for gaming merchant account in London and Europe but world-wide. http://www.radiantpay.com/gaming.html mentions more about the gaming merchant account of our company. 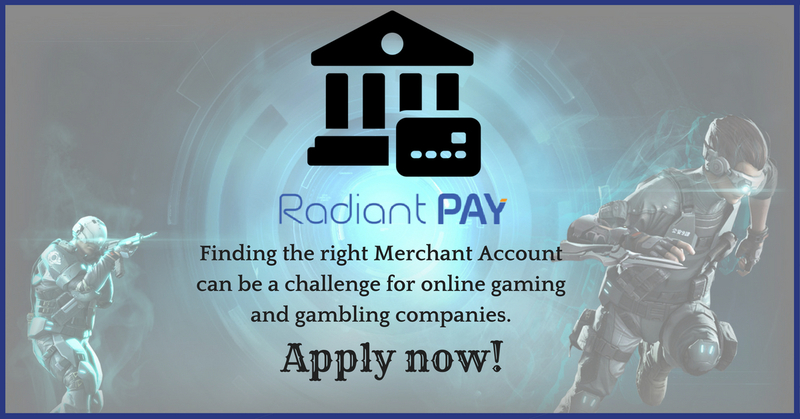 Radiant pay provides solutions for this high risk business called gaming in the form of merchant account for online gaming. We adhere to the international rules and regulations along with the country we are in operating in to provide you with a gaming merchant account. – This category of business comes in the high-risk business. We comply with all the regulations. – We have partnered with many banks to provide you with casino merchant accounts. It is beneficial to have a casino merchant account as the payout will be able to be done in that same card from which you had done your payment. It is a profitable business but banks consider it risky in Europe and also in other countries. There is always the possibility of high chargebacks. Refund claims is another problem. Also, customer many a times, dispute a transaction due to various reasons. A high-risk business, having a betting merchant account has its advantages. It brings ease in doing your business. The services we offer are all secure and we strictly go with the rule book. Try merchant account for online gaming at Radiant Pay. Running a gaming business or have online gaming website and it is hard to run an online gaming business. You need a watchful eye on everyone inside your casino for there will always be people who would do anything to win games. Managing what goes on inside a real casino may be hard but running one online is a very different story. Online gaming is considered a high-risk business because they are more likely to experience online fraud, high chargebacks than other types of business. Over the Internet, it is easy for experienced hackers to hack these online gaming websites into giving them money they did not win. The traditional cash transaction is not anymore, because credit cards are convenient, safe and hassle-free. Merchant Accounts for gaming industries are what you need that makes you able to accept credit or debit card payments. More and more high-risk businesses are getting these accounts to provide their customers with easy means of the transaction to keep them coming back for more. There is a large number of people who love to buy products online. It saves the huge time of visiting stores and looking for what they want to purchase and sometimes it is hard to find the shop for some particular item. While shopping online you have all things on your fingertips. To serve best user experience all you are E-commerce merchant account that allows you to accept online payments for your goods and services. Increase conversion ration and market reach that allows all the major cards and alternative solutions. Real-time monitoring of gaming merchant account and guaranteed uptime. With our gaming merchant account, you can do different currencies settlement. We have fraud scrubbing technique and technology system we provide full chargeback protection and reveal you with the fraudulent chargeback and cost. We provide a customized solution to meet all the business needs. We give cost effective solutions regarding gaming merchant account. We offer instant deposit and payout to multiple accounts. betting merchant accountcasino merchant accountgaming merchant accountgaming merchant account in London and Europegaming merchant accountshigh risk gaming businessmerchant account for gaming businessmerchant account for online gamingradiant pay. Gaming and Gambling High-Risk Merchant Accounts – What you need to Know? 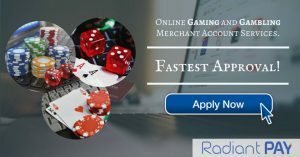 www.radiantpay.com specialize in online gaming and gambling merchant account services that are specially designed for gaming and casino industry. An online casino or gaming merchant account allows merchants to control their businesses and revenues with International Payment Processing. The online gaming and betting industry in the UK contribute a huge percentage of market share in the gaming and casino industry. Online bingo sites, casino games, and sports betting cover a major portion of this percentage. The tremendous popularity and easy accessibility of many gaming sites and apps increase the importance of merchant account for accepting international credit card payments. Online gambling also is known as the gaming industry in the merchant account service industry. Many card processing company and banks consider this as a high-risk industry due to high credit card chargebacks frauds and high volume of transactions. Gambling business generates high-volume transaction thus increases the risk when an acquiring bank accesses the merchant profile. Many of these businesses are based offshore hence, it involves a higher rate of credit card fraud and money laundering. A startup business firm found difficult to acquire online gaming merchant account due to lack of credit. How Merchant Account Services Benefits Gaming Industry? If you own online gaming business, you could grow more than what you expect it with Radiant Pay flexible Gaming Merchant Account Solutions that help the merchant to grow internationally. Business firms around the world have taken merchant account to help them bring more revenues and clients with the seamless payment option. Getting an online high-risk merchant account for your gaming sites or app allows you to accept a credit card from a different customer. Merchant is allowed to accept payments from Visa, American Express, Discover, MasterCard, thus expanding your business internationally. By integrating high-risk payment processor your business will gain double of regular profits because you can cater your business globally breaking the barriers of catering people in the local area. A gaming or casino merchant account can boost your sales dramatically. This merchant account benefits both you and your customer by accessing to seamless payment from anywhere, anytime. However, getting one for your high-risk business can be difficult, once you have found the right processor that you think is reliable, the process will amaze you, and only a simple term will be made and will take very short time to complete the transaction. There are many merchant account provider in the UK who charge unnecessarily high fees for Gaming Merchant Account. At Radiant Pay we understand you need and importance of business and that why we offer simple and flexible high-risk credit card processing for offshore gaming or casino merchant account with the new technology of fraud protection, multi-currency processing, affordable solutions, and real-time processing.